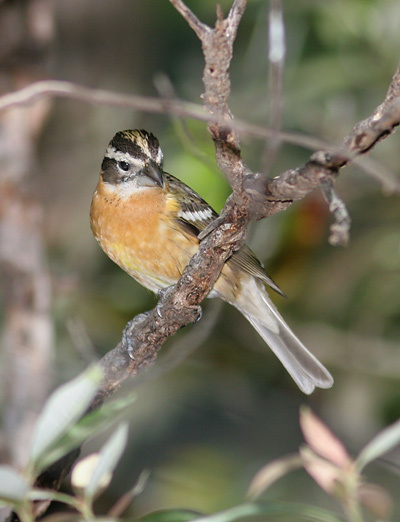 Here in southeastern Arizona, Black-headed Grosbeaks (Pheucticus melanocephalus) are common summer residents in oak-pine woodlands and riparian canyons in the mountains, especially along the woodland edges and in other openings in the forest. Black-headed Grosbeaks are also common transients in a wide variety of habitats here, and I regularly see them at my Tucson, Arizona bird feeders during the springtime and sometimes during the fall as well. 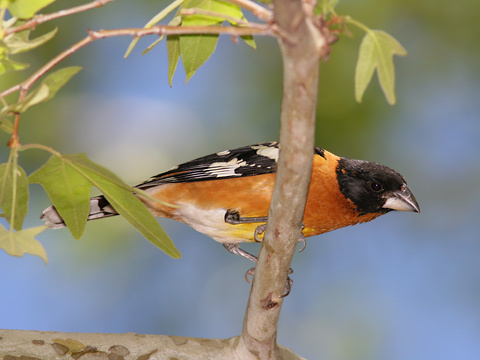 Male Black-headed Grosbeaks are cinnamon-orange in color with a black head, black wings with white wing bars and patches, a black tail, and a large, conical, blackish beak. Female Black-headed Grosbeaks also have a large, conical beak, but they are a duller, paler cinnamon color and have a striped head, brown wings with white wing bars and patches, and a brown tail. 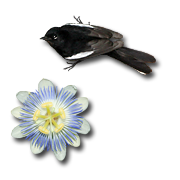 Grosbeaks are named for their unusually large beaks and variations of "grosse" translate as big or large in German. Black-headed Grosbeaks feed on insects, fruit, and a variety of seeds, which their large beaks are able to crack open with ease. At my bird feeders, the seed-loving Black-headed Grosbeaks prefer cardinal seed mixes with plenty of sunflower and safflower seeds.